This is a family photo that was taken a little bit ago. We are a family of super heroes. In some circles I am known as Mr. Incredible. I can’t tell you where those circles are, but I am pretty incredible. That’s my wife on the left, she is Elastigirl. She was an All-American gymnast back in the day. Kristin is in the middle, she is not in costume in this picture, but her Super Hero name is The Money Pit. She has an uncanny ability to make money disappear at an alarming rate. Kyle is the one in glasses. His name is The Professor. He is the smartest one of the bunch. Then there is Luke. Yeah he looks cute in still frames like this one, but he is a bad one. His name is The Tormentor. He is all about tormenting others, especially the Professor. Bye the way, damn I guess the gym is really paying off!!! Oh, and I heard the Goofy kept eyeing your wife up the whole vacation? 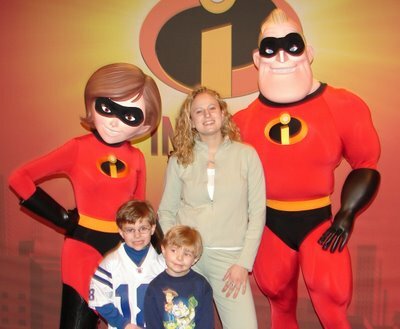 What an "Incredible Family"! The stuff comic books are made of! Can't wait for the First Edition.Of course, this blog could very well be the first edition. The Lawn Whisperer is Incredible! How bout that Lawn? Incredible Yet? I think not! Too much time on the blog, too little time on the lawn. Can't possibly meet the standards yet. Get to work, Whisperer! Your kids and wife are adorable. Is that you standing next to her..the tallest one with the biggest mussles.....?